What IP camera manufacturers do integrators really like the best? Over the last month, we ran an in depth survey gathering results from over 80 integrators across 19 countries to understand what technologies, approaches and products they preferred. As part of the survey, integrators explained why they preferred what they did. In this report, we share our findings for IP cameras. Of the 80+ total responses, integrators recommended 18 unique IP camera manufacturers and provided more than 15 pages of written explanation behind their choices. With IP cameras, the big challenge in analyzing favorites is dealing with Axis. Because Axis sells so many more IP cameras than other vendors, the analysis runs the risk of declaring Axis the favorite simply because it is so often used. The percentage of integrators declaring Axis to be their favorite relative to Axis's market share: If the level of favorites is lower than their market share, this is a bad sign as it signals that integrators are likely disatisfied. However, if the level of favorites is higher, this is a strong indicator that Axis could still be strengthening. The level of negative reviews. We asked a related question about worst experiences with IP cameras. Vendors, including Axis, that received a disproportionate high number of negative reviews provide a strong indicator of poor overall experiences. Finally, as we did with Integrator's VMS favorites, we examined and categorized integrator's detailed responses to better understand why integrators choose different companies - whether it was for image quality, technical feature sets, support, price, etc. As with all IPVM research, manufacturers are strictly forbidden from using the results to market or promote their products. This information is offered only to help the community understand what integrators prefer, not to assist in the selling of surveillance products. Axis 'won' in a landslide - 47% of integrators selected Axis - far exceeding their market share and more than 4 times the closest competitor. Axis was praised across the board by integrators with only common critique - pricing/margins. In a clear, yet distant, second place was Sony most frequently cited for their image quality. After that, three manufacturers finished in a tight group - Panasonic, Mobotix and Avigilon. Following the top 5 was ACTi, however ACTi received an alarming number of negative reviews offsetting the positive. These 5 companies combined for just over 75% of the total favorites given. While Axis is typically estimated as having somewhere between 1/4 and 1/3 of the IP camera market, by sales volume, the number of integrators citing Axis as their favorite is far greater. "Axis covers all the bases. They have the greatest selection and the product works out of the box. Also they are easy to configure once deployed. Support is also important and reliability as well." "Hands down, best combination of price, quality, and range of product in the market." Unlike any other manufacturer, Axis received praise for pretty much every facet of their business - even a number of people commenting favorably on their expanded low cost options. "They have been reliable with good support"
"Never fail, easy to install"
"Once installed and configured they run and the picture quality is good." "Quality, confidence in the product." "We sell hundreds, if not thousands of them a year. We have very few Axis cameras that come back with warranty issues. If all of our equipment worked as well as Axis, my life would be a lot easier." "I get nothing but compliments from my Technicians in the field and customers." This is quite consistent with our own testing and from anecdotal reports from integrators over the years. With Axis, hidden costs and problems from poor reliability or immature development are minimized. "The company has a great commercial, pre and post sales support and the camera's software is easy-to-use with the possibility to configure several non trivial parameters." "Quick Response to our issues"
"You get a wide varities for selection"
"Rock solid and huge range"
"broad product line, stable operation"
"New range is very price competitive"
"Come in a variety of megapixel resolutions and prices so it seems that they are more accessible to smaller budgets." "They have a great depth of product so we do not constantly need to go to other manufacturers for specific camera views or products"
Broad product lines with high quality makes it easy for integrators to choose niche products for specific applications yet to maintain a high level of confidence that the product works. As we have examined over and over in the last 2 years, Axis's new product introduction rate is unmatched and their lead in total number and range of products is likely just as great now than it was a few years even before the flood of new IP camera entrants. "Continue to innovate ahead of the competition. Everyone else is still struggling to catch up." "Find ways to innovate and make things better"
Image quality was frequently praised for Sony and Panasonic but hardly at all for Axis. This is definitely a risk as we have seen this in our tests - Axis image quality is solid but not exceptional. It will be interesting to see how well the Q1602 and Q1604 rectify this gap. "Granted my margins are cut 10~ 15% but they are the best." "While expensive they are in my mind clearly the leader in IP camera tech"
"I hate to say this but AXIS. They have a broad line of cameras and have made big strdes in the past few years." - the 'hate to say' is an allusion to Axis's pricing/margins. "Axis. Dealer support and distribution...I will leave it at that. Not really a bad experience with the camera themselves." "Axis, because they don't get the market/margin concept"
Axis is clearly doing well today overcoming their weakness of unattractive margins with strong products, support and innovation. However, if Axis was to stumble or if a competitor could come close on Axis's main strengths with a more attractive distribution plan, integrators might be likely to switch. lighting situations. The encoders can send coaxitron signal and the product line is complete." "Like Sony because of the auto focus capability. The image quality is also sold and the product line is extensive." "Ease of setup, supported across multiple platforms, nice features, reliable and a decent integrator program"
"No problems with support or camera defects. The cameras work very well and are easy to work with." "Great image quality, very few quality issues." "Good pricing. Easy installation. Crisp and clear image." "Good quality images. Good options and features. Not perfect, but best I've dealt with so far, though it's not a broad range." "Sony simply because of image quality"
"Picture quality is the best. And they are super reliable. They are not the cheapest but they are worth it." "Great product image Quality, analog port for set up. Focus assist and Auto back focus Protected line." "Low failure rate. Auto focus on most models." As in our tests and reviews, Pansonic is quite solid but seems to be modestly outpaced by Sony currently for overall product range, price and image quality. "Easy to use software and and huge MP options"
"Image quality, remote zoom/focus, warranty and turn around time, so easy to install"
"Big range from 1 to 29 megapixel. We can choose proper camera for proper application." 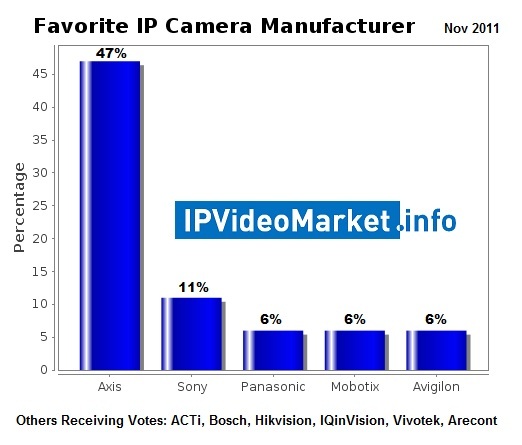 Somewhat counterintutively, Avigilon received more votes as integrator's favorite VMSes than their favorite cameras. However, at some level, this can be attributed to the Axis effect. Our main objections to the Avigilon IP camera line remains the requirement of JPEG200 and the use of Avigilon's own VMS for their traditional cameras, which are still the majority of their camera line. "Feature set is robust and meets the needs of most of our clients. We have also found it to be receptive to most IT personnel that we are introduced to and work with." "Mobotix is a very unique company with unique solutions. I wouldnt use them everywhere, but they have always fit the bill and performed perfectly an those special situations." "Perfcet price-performance balance, much better marging than AXIS"
"We love the new 4MP products. Awesome features for the cost." "They seem to work fine and are reasonably priced." The rationale for ACTi is much different from the Top 5 as ACTi integrators are clearly choosing them as a budget brand and with cost as a main priority. That noted, ACTi received many negative reviews in the associated IP camera 'worst experiences' question and came in 2nd overall in that category. Now, compare to the Worst IP Camera experiences.